'White Civil Rights Rally' Approved For D.C. In August White nationalists and their allies are set to gather on the anniversary of last year's "Unite the Right" rally. The National Park Service approved an application for a rally near the White House. 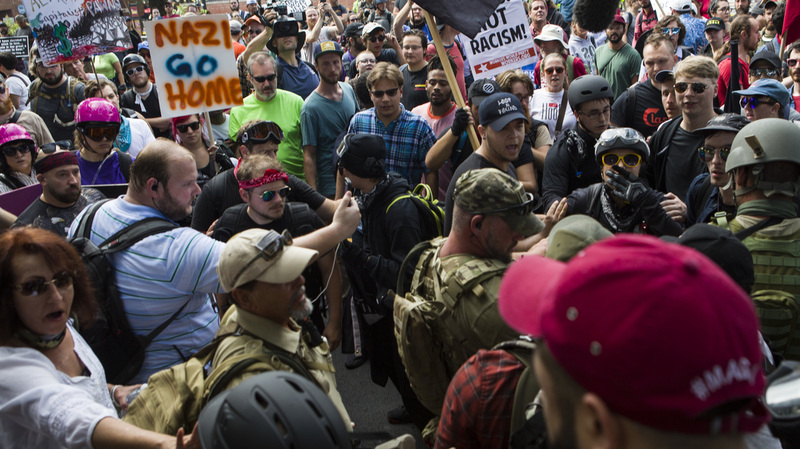 Protesters and counterprotesters clash during the "Unite the Right" rally on Aug. 12 in Charlottesville, Va. One woman died when a car drove into a crowd. The rally in Charlottesville last year drew hundreds of white nationalists and supporters who faced off in clashes with counterprotesters. A self-described neo-Nazi drove a car into a crowd of anti-racist protesters, killing 32-year-old Heather Heyer and injuring more than a dozen others. President Trump drew fierce backlash after blaming "many sides" for the violence. Protesters came out in cities across the country the day after his remarks to condemn white supremacists. In an application dated May 8, Kessler estimated that as many as 400 people would attend. He listed the purpose of the event as: "Protesting civil rights abuse in Charlottesville Va / white civil rights rally." The Los Angeles Times reported that the park service is now "gathering information" to issue a permit, which will "specify the timing, boundaries, sound regulations and liability rules for the event." National Park Service spokesperson Mike Litterst told the paper that "public safety and the protection of park resources are taken into consideration" and said the agency does not "consider the content of the message presented." Kessler also applied to hold a rally in Charlottesville on Aug. 12, but the city denied the application, according to The Washington Post. Kessler is suing the city; the case is still being decided. Kessler told the Post that he will have rallies in both D.C. and Charlottesville if he wins in court. A website from organizers of the "Unite the Right" rally lists the event's primary location as "Lee Park" — now called "Emancipation Park" — the Charlottesville park that has been at the center of controversy because of its statue of Confederate Gen. Robert E. Lee. Lafayette Square, which sits across Pennsylvania Avenue from the White House, is listed as an "alternate location." Kessler and other organizers have asked participants to be able to travel between Charlottesville and Washington. An independent report issued in December faulted the city of Charlottesville in its response to the events of Aug. 12, saying authorities failed to protect both people's safety and their free expression. The Charlottesville police chief, Alfred Thomas, retired later that month.